For the Christian, every season is a season of thanksgiving—slowly but steadily the awareness grows: “For of Him and through Him and to Him are all things, to whom be glory forever. Amen” (Rom. 11.36 NKJV). At Reformation Bible College, we are thanking the Lord God for many things: for another semester in which we have experienced His faithfulness and kindness; for the dedicated leadership at Ligonier, and for our board of directors; for our gracious donors and supporters; for our adventurous RBC students and their parents; for the kingdom-minded labors of our faculty and staff. In light of the last mentioned cause for thanksgiving, Reformation Bible College is pleased to announce our latest faculty hire: Dr. Aaron C. Denlinger. Aaron will join our faculty as Professor of Historical and Systematic Theology, starting in August 2013. He and his wife Louise have two daughters, Kaitrin and their newborn Geneva Ruth, as well as a “much loved dog named Oakley.” Aaron earned his MAT from Westminster Seminary California (‘04) and his PhD in Divinity from the University of Aberdeen (‘09), where he now serves as Teaching Fellow in Church History. 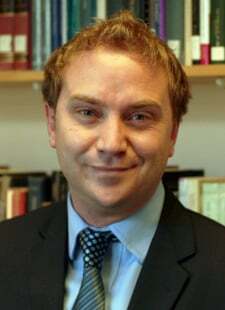 He is the editor of a forthcoming volume titled Reformed Orthodoxy in Scotland: Essays on Scottish Theology c1570-c1750; the author of Omnes in Adam ex pacto Dei, a study in early modern Reformed thought on the covenant of works and original sin; and currently serves as Secretary to the Society for Reformation Studies. We are grateful for the passion Aaron has to draw out the theological riches from the history of the church, and are excited about how his gifts will be used to the benefit of our own academic community. Join us in giving thanks to God for this abundant provision, and in praying that God will use Dr. Denlinger and all of us at Reformation Bible College to train up a new generation of God-fearing, Christ-exalting, fruit-bearing servants—Christians grounded in the Word of God, who will shine as lights in the midst of a crooked and perverse generation. To declare Your lovingkindness in the morning, and Your faithfulness every night. This post was originally published on the Reformation Bible College blog.